For someone who is willing to share his knowledge and giving me guidance unconditionally. Only way I can think of thanking him, is to give him a meaningful gift, in this case, a caricature of him. 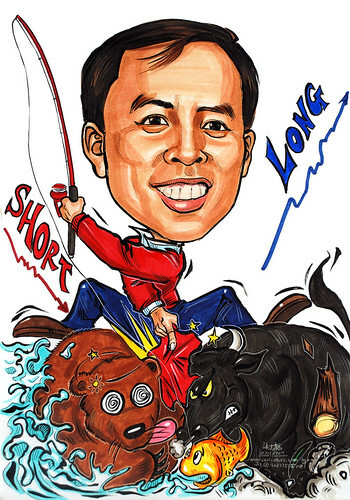 He has the ability to make money in the bull and bear market every trading day. Thus, the theme which I have been thinking in mind these few months is along this line. Upon completion of this artwork, I have another idea, which I should have made the background better, by including the bar chart graph with trend lines in lighter colours, against a dark background. It would have look better, rather than a direct approach of the 'long' and 'short' graphs and headings. But it is too late.